MAGICK RIVER: The Unstoppable Tide of Inevitable Change Keeps Rising! The Unstoppable Tide of Inevitable Change Keeps Rising! ... but the crowd came prepared & stayed put! 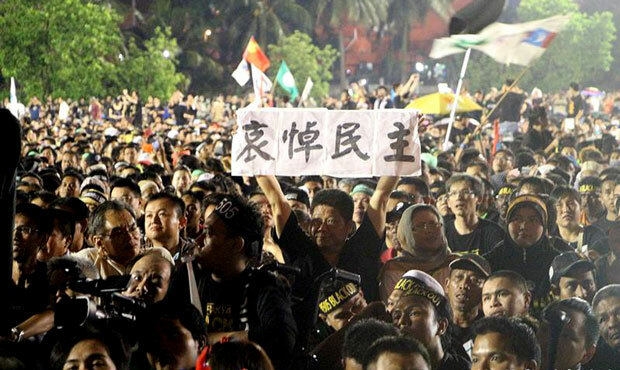 Does the sign read "Reformasi" in Chinese? 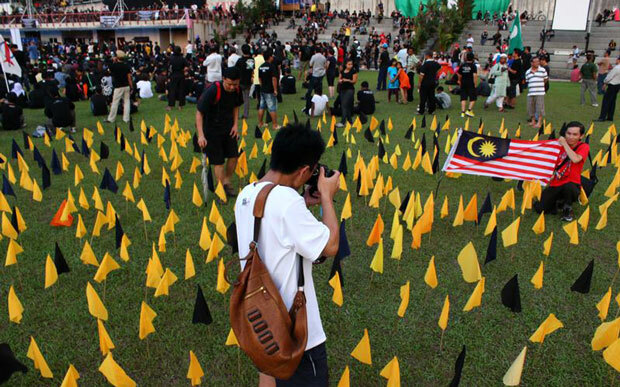 What a neo-Nazi criminal regime fears most: a Malaysian Spring of hope! Election Commission heads MUST roll! ... against the real enemy of the people, a corrupt kleptocratic elite! ... turning the event into a beautiful manifestation of hope, optimism & light! 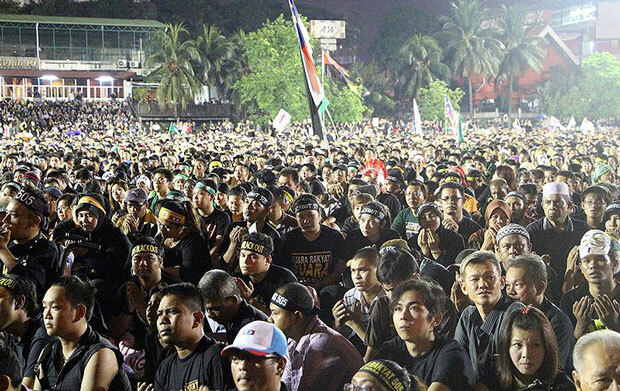 11.45pm - After seven hours, the Suara Rakyat 505 rally came to a close with everyone singing Negaraku. 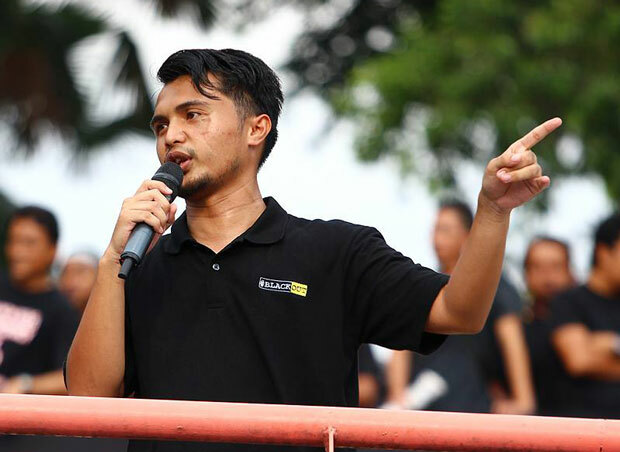 Prior to that, emcee Badrul Hisham Shaharin says he needs 500,000 volunteers for an event he called "March to EC", hinting that there are far bigger rallies being planned. 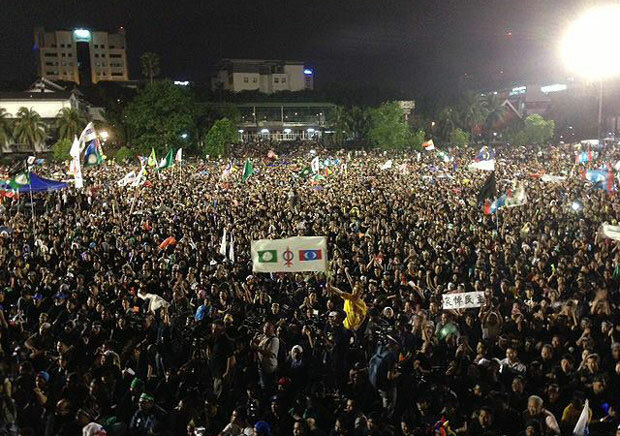 11.20pm - In a show of humility, Anwar Ibrahim tells the crowd that he is sorry that Pakatan Rakyat was not able to form the federal government. "So some of our plans can't be implemented because of that," he said. Regardless, Anwar (left) says that Pakatan will never give up and that it was BN who should be accepting defeat. He says that the White House had congratulated Prime Minister Najib Abdul Razak with a condition: That the polls must be free and fair. "That's why the EC must resign now! Now! Now!" he said. He said that Monday is the last day for the public to lodge police reports on electoral fraud and urge them to do so, particularly over the fact that "indelible ink" was removable. He added that there will be a few more Black 505 rallies left. "Do we go on or stop here?" he asks, to which the crowd replied "Go on!". He then promises that any mobilisation of the people will be done peacefully. 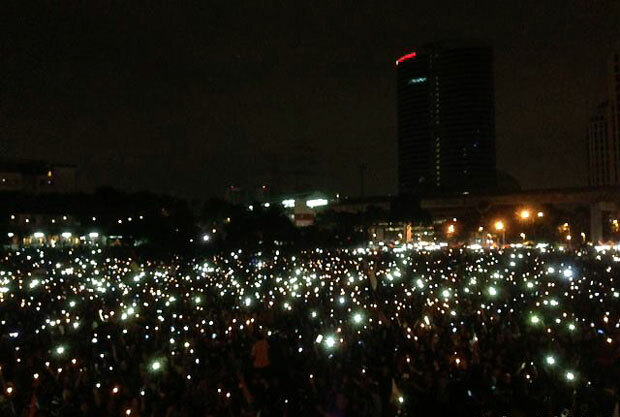 11.05pm - Emcee Badrul Hisham Shaharin has called for the Dataran PJ floodlamps to be switched off and for rally participants to whip out their phones and lighters to light up the venue. 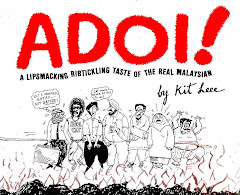 The idea is to celebrate the release of Adam Adli, a student activist accused by the state of sedition. He is Penang now to visit his ailing mother. 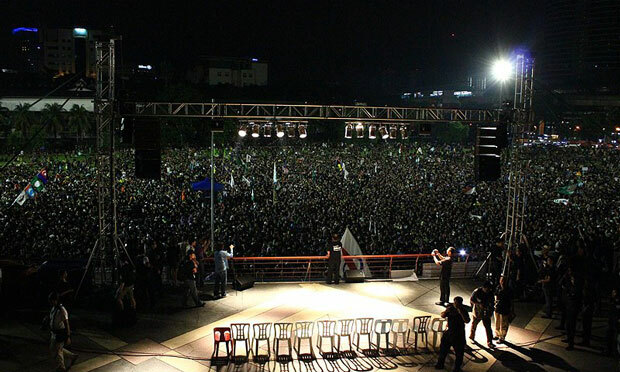 "We will shine a path for democracy," he said, while estimating that the crowd size has now swelled to 70,000. The crowd oblige and the wave their electronic devices. Looks like a swarm of fireflies. 10.45pm - Lembah Pantai MP Nurul Izzah Anwar (left) says that the Election Commission must pay for their "crimes". "You can never escape the clutches of the law," she said. She said Pakatan had scored a moral victory on May 5 but the coalition and their supporters still have much to do. "Tough times don't last. Tough people do," she said. She adds that Pakatan will continue to mobilise the public to ensure that BN doesn't get its way when the electoral boundaries are re-drawn. 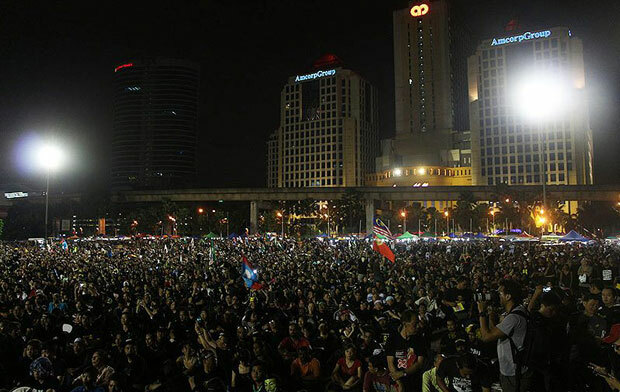 10.40pm - Haris Ibrahim urges the crowd to boycott media organisations that are lopsided or aligned to BN. Following this, he announced that the Asalkan Bukan Umno group has prepared a video clip to show how BN had cheated during the general election. "We want you to bring this video to the rural areas, to show how they were being cheated by BN," said Haris. 10.30pm - After sharing a cell in Jinjang, Tian Chua (left) and Haris Ibrahim share the stage together. "Don't think that these arrests will scare the people. We will not be cowed. "It is not us that are afraid. It is they, for they are holding to power without legitimacy," said Chua. 10.20pm - Bersih 2.0 co-chairperson Ambiga Sreenevasan says she was not scheduled to speak today but the recent arrest of Adam Adli, Tian Chua, Haris Ibrahim and Tamrin Ghaffar had moved her to do so. He urges those with evidence of electoral fraud to approach Bersih's people's tribunal. "If the EC has any dignity left, they must resign now. (The failure of the) indelible ink is reason enough," she said. 10.15pm - In a strange move, Kuala Kerai MP Dr Hatta Ramli and Sungai Petani MP Johari Abdul decided to speak at the same time. But it was Hatta who stole the show with his wisecracks. 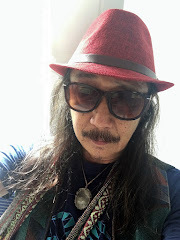 He said that BN was no so worried about a certain word and have asked the Multimedia and Communication Commission (MCMC) to investigate politicians who mention it. "What is the word? The word is musim bunga. I dare not utter the word in English. "What I got my car fixed, I couldn't tell the foreman to change my suspension. I had to say 'Please help me to change my musim bunga'," he quipped. 9.45pm - Pandan MP Rafizi Ramli (left) says there would not be enough jails for the government to incarcerate all those who voice out against electoral fraud. Rafizi, who chairs Pakatan's committee to probe electoral fraud, says that people have lost confidence in the EC because the have broken their vows. "If the rakyat says there is fraud, isn't it their duty to investigate?" asks Rafizi. He says that Pakatan will be filing about 29 election petitions and strongly hinted that Bersih 4.0 might involve occupying Dataran Merdeka. 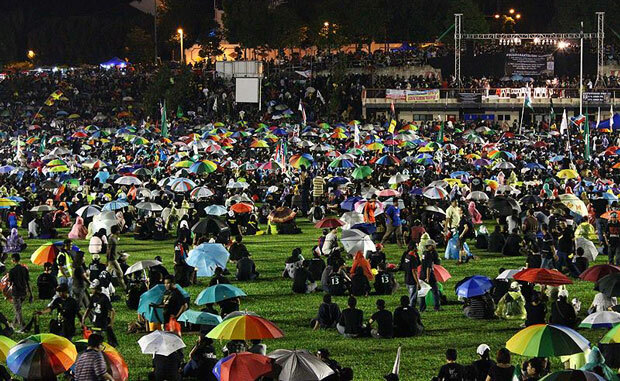 9.30pm - The Dataran PJ field has now reached saturation point. Emcee Badrul Hisham Shaharin (right) announces that there are 50,000 people in attendance. 9.25pm - Blues singer Ito, from the Blues Gang fame, belts out "Ubah Sekarang" to which the crowd responds by waving their hands in unison. 9.20pm - Kuantan MP Fuziah Salleh (left in photo) is speaking now and she said that the Election Commission chairperson Abdul Aziz Yusoff is living off public funds. She says that his wages will not be "halal" if the EC continues to disregard public opinion. 9.10pm: Badrul Hisham Shaharin, aka Chegubard, takes over as the emcee and introduces DAP's Ronnie Liu onto the stage. "We need to reform the electoral system. If not, we won't make it to Putrajaya. "I believe it is time we launch Bersih 4.0!" he said, to the crowd's approval. 9pm: As the rally continues, the crowd size had doubled to approximately 20,000. 8.15pm - The sky is threatening to open up on the crowd and is serving up a slight drizzle. 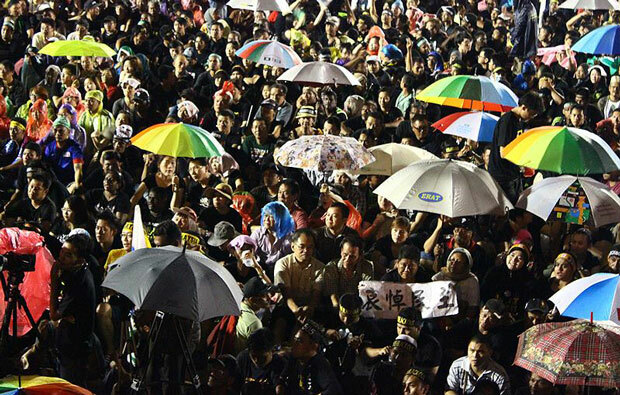 Many people are sporting umbrellas. 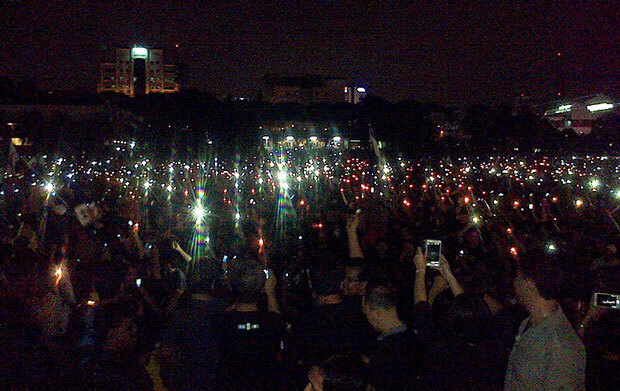 7.30pm - Crowd size has grown to 10,000, which is much smaller than anticipated by the organisers. 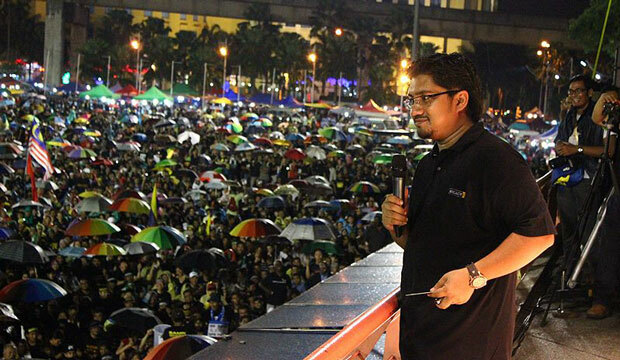 7.15pm - Solidariti Anak Muda Malaysia (SAMM) chief Badrul Hisham Shaharin, better known as Chegubard, takes the stage and urge participants to call on their friends to join the rally. "Tonight, we will be joined by the reformasi 'tank' - Tian Chua! 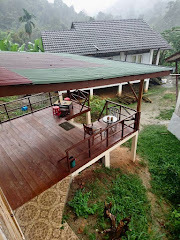 Then there's another person, whom before we had a chance to invite him told us that he will join us - Haris Ibrahim!" announced Badrul Hisham. 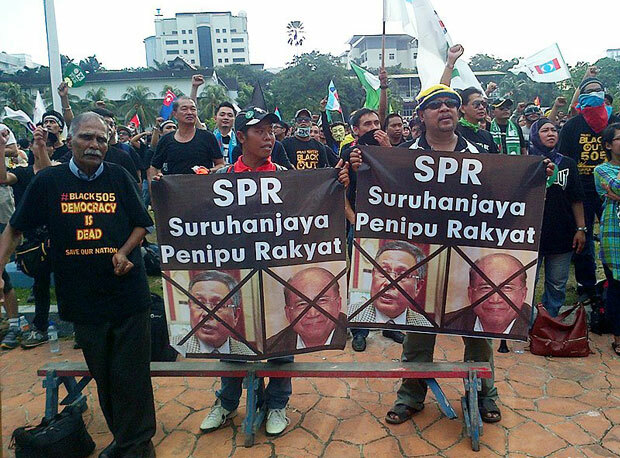 Chua, Haris and Tamrin Abdul Ghaffar are being investigated for making seditious speeches during a forum on May 13. Another speaker at the forum, Adam Adli, has already been charged for sedition. All four are expected to speak tonight. Badrul Hisham (left), who is believed to be wanted by the police for making "seditious speeches" alongside the abovementioned group, also announced that PKR strategist Rafizi Ramli will be presenting a slideshow later to show examples of electoral fraud. 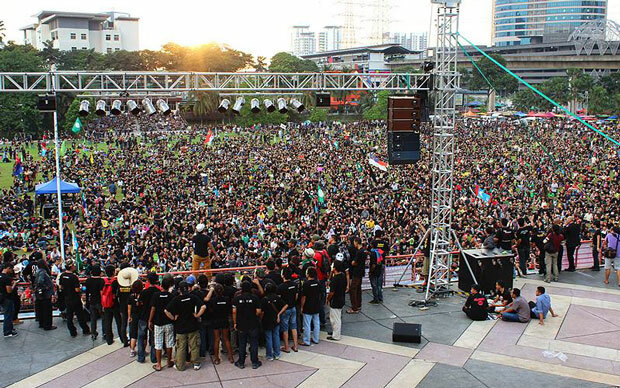 Meanwhile, Badrul Hisham said the main objective of the rally is to campaign for reform in the electoral system. After Badrul Shaharin spoke, there is a short break for mahgrib prayers. 6.45pm - Student activist KS Bawani (right), of the "Listen, listen, listen" fame, urges participants to "incite" their friends and relatives to join the rally. “We had said before the general election that if the EC cheats, we will go down the street, this is the right of the people. “We don't want to talk anymore. We've had enough. The people are not stupid, we don't want to wait for another five years. 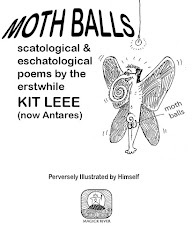 “We don't have much time, we need to incite more people. Please tell your uncles and aunties to come to Amcorp Mall,” she says.